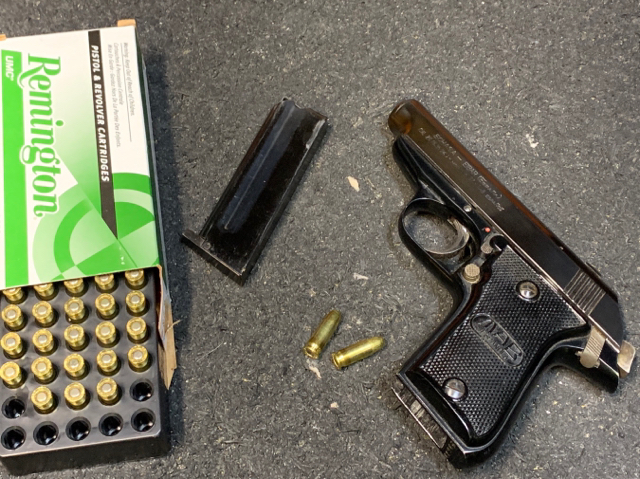 A friend has .25 cal pistols as his collection niche so today was mostly .25 ACP range day.... a MAB Echasa-Eibar made in Spain, a Walther TPH and a Bauer Firearms .25 Automatic. I only have a general familiarity with these particular models. I understand there’s a French made version of this MAB. 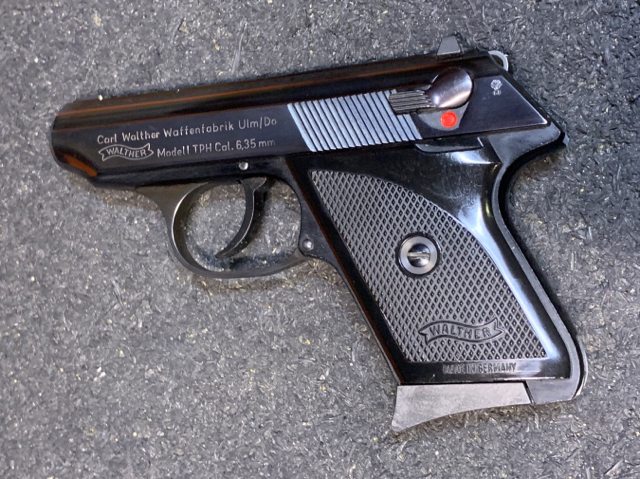 The Walther has a very nice blued finish not apparent in the range photo. The Bauer is an American made, near copy of the FN Baby Browning. This one sports “mother of pearl” plastic grips and is contrasted with a .38 spl round for size reference. 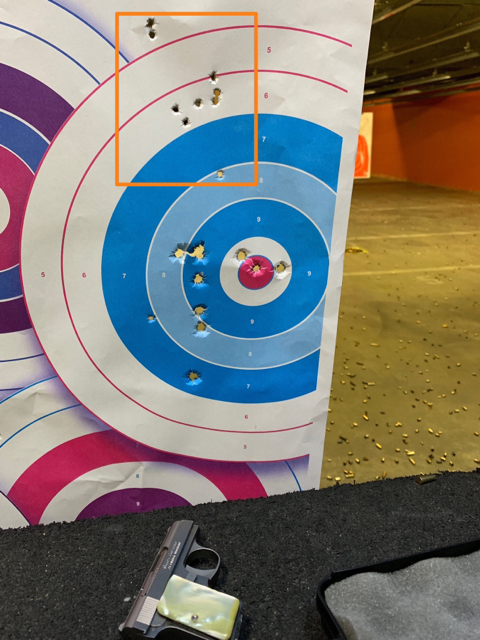 One can get some decent groups out to 7 yards with the Bauer in slow fire. It’s always a pleasure to shoot some of these pistols and calibers of a bygone era. Old .25's are really cool old guns. 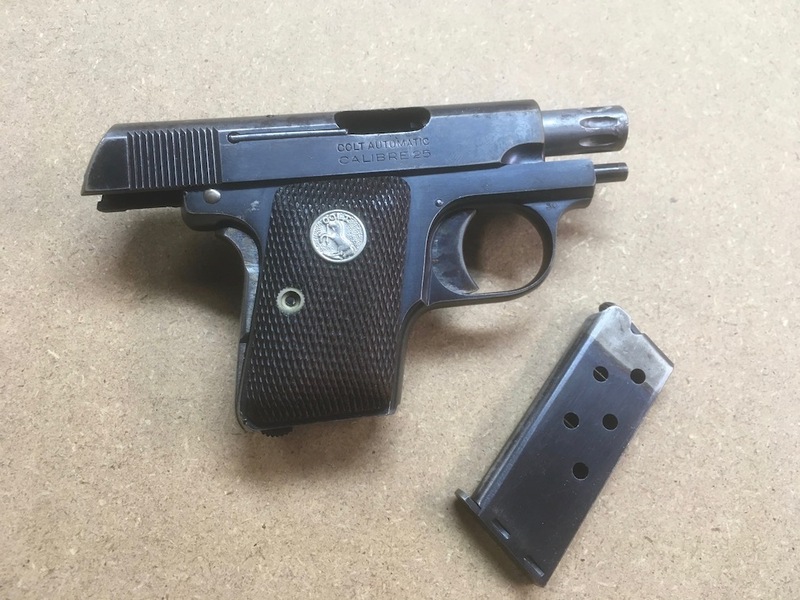 While not a powerhouse round there are some really well made examples out in the world and the little mouse round gave us some fine true pocket pistols in days gone by. 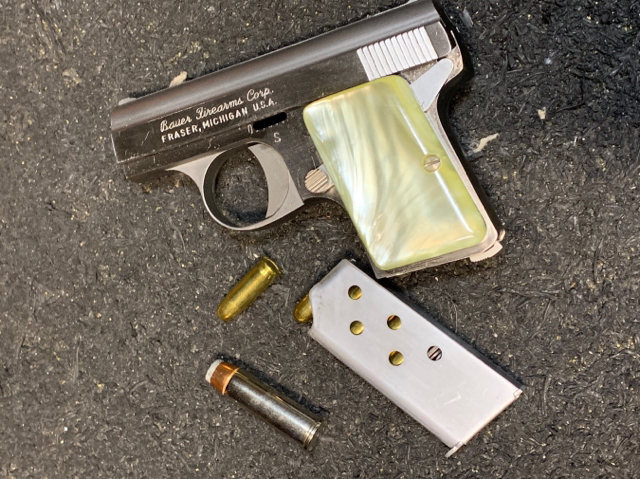 Was out at the range today shooting my Bauer and every one at the range today wanted to come by and see this tiny gun. I let several shoot it. I have taking a liking to this little mouse gun, but I am still working on the intermittent failure to feed issues with it. The firing pin on a Bauer (or FN Baby Browning) serves doubly duty as both the ejector and the firing pin Today I think I finally figured it out. It appears the sear wasn't always catching the firing pin and it allowed the firing pin to stay forward (acting as the ejector) and trap the next round pinning it down to the magazine. When I disassembled it tonight I looked more closely at the underside where the firing pin notch catches the sear and it may be slightly off or worn. Anyhow, I just ordered a new firing pin from PSA and hope that restores it to proper functioning. When it runs I can shoot 2" groups at 5yards even with those tiny sights. Thanks for posting, good timing. I have a Colt Auto .25 (Junior). One of the later one's 1970 or 71. I've never had any need for a nose gun. I purchased it because you dont pass up 100 dollar Colts even if they were mostly made by Astra. Mostly a novelty, shoots to the right with whatever it's fed. Its the only firearm of mine that's ever been given a name, The Noise Cricket. I didn't name it but the name stuck anyway. I can only get 2 fingers around it. I have a Phoenix Arms PH25 I bought new a few years ago. Its nothing fancy but is so much fun to shoot. It's a bit bigger than the examples you show but recoil is non existent, it's very accurate and has been 100% reliable. 25acp can be lots of fun. That Walther is just pure bliss. I'd like to own one even if I'll never use it. When it comes to MAB though, I have the story the other way around. What my father-in-law has is a French production which is sort of normal considering he's French as well I guess. A Spanish production line copy could be a nice present to complete the set but we are at the process of getting a mortgage approval for a flat in Spain and if it goes through we'll be relocating there to be close to the parents in law living in Montpellier. Spain will be completely foreign territory to me. Has anybody (especially in EU) have an old firearm like that shipped to them? Or will it be absolutely impossible for an individual to import a pistol there? In some countries, if the pistol is disassembled or missing a functional part, they allow it to be received after a formal examination but I have no clue how EU acts on that. Frankly I fear that I can not buy one from anywhere else in the world, unless I pay the guy to conceal it and bring it to me personally by flying there.